Dashboard front end for the UNIX command tail. Is there a better alternative to tailDash? Is tailDash really the best app in MP3 category? Will tailDash work good on macOS 10.13.4? 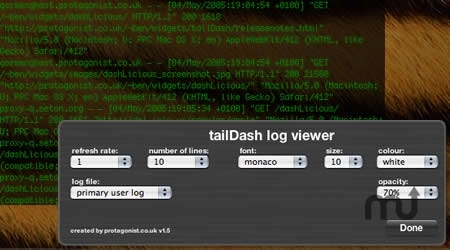 tailDash is a Dashboard front end for the UNIX command tail. It allows the user to select which log file they are viewing and the refresh rate of that log. The viewer window is also resizable to the user's needs. tailDash needs a rating. Be the first to rate this app and get the discussion started!